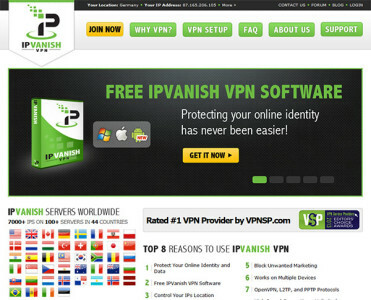 IPVanish is a relatively new provider of virtual private network (VPN) services, although the company has been an established player within network management, IP provision and associated businesses for several years. The company offers more than 50 server locations globally, so users can select locations best suited to their anonymity requirements. Setting up the service is a simple matter of downloading from the IPVanish website and following the easy visual guides and instructions. Once the service is downloaded, users just need to log in prior to surfing the net and this will establish their secure connection. This service ensures user anonymity, even the internet service provider (ISP) will be unable to view details of internet use or websites visited as the data will be encrypted. The VPN gives users a secure environment by creating an anonymous and private tunnel for internet use which is firewall protected, bypasses censorships and site blocking and prevents users becoming victims of cyber crime. Customers don’t need to worry about choosing the correct server to suit their needs, it’s a simple matter of deciding which location is best suited to the purpose required and the system allocates the user to best server location and IP address available at that time. Read more about the VPN Provider. IPVanish provide three price plans for their service and key features include round the clock technical support services, high speed connections with no charges for bandwidth and more than 14,000 available IP addresses at different worldwide locations. IPVanish also share IP addresses among users, when 15 or more people are using the same IP address it is almost impossible for user web activity to be identified. The software can be loaded to as many devices as required by the user, however it is only possible for registered users to operate two devices simultaneously and they will need to be operating on different protocols, for example a laptop using an OpenVPN protocol connection and a mobile device using an L2TP connection. Gaming enthusiasts should see marked speed increases when using IPVanish as the service provides quicker routing and transit speeds than standards operated by ISPs and does not throttle the service at all. These benefits should ensure gamers receive competitive advantage while playing online. Here is another Review about IPVanish. IPVanish is a perfect security solution for business users as it keeps sensitive company data safe from cyber criminals. This is also the case for customers using mobile devices as the encryption of transmitted and received data ensures complete safety for any online banking and shopping activities.